There's a way to train for muscle growth, and a way to train for strength. But they're not the same thing...right? A PhD put the old way of doing things to the test and gives you the insider's perspective! Prior to becoming a researcher, I was just another diehard lifter strictly adhering to the deeply ingrained rules of bodybuilding. But over the years, the academic in me has grown to question even the most fundamental principles of training. Sets of 8-12 reps, 60-80% 1RM, rest 30-90 seconds. Sets of less than 6 reps, at least 85% 1RM, rest 3-5 minutes. Textbook stuff, right? While these training philosophies are typical of bodybuilders and powerlifters, there is actually surprisingly little evidence to support such distinctions. So a team of researchers and I decided to put them to the test. Here's what we found, along with the exact protocol we used, so you can try it for yourself! Numerous scientific studies have investigated the effects of different exercise intensities on muscular adaptation over the years, and the results have been somewhat inconclusive. In most cases, studies were conducted using untrained subjects, and let's be honest, untrained individuals will adapt and grow following just about any form of resistance training. Even initial strength gains are simply a neurological adaptation resulting in a more efficient muscle-activation pattern. 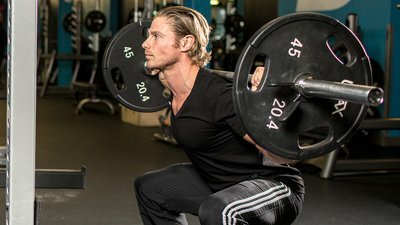 Experienced lifters' bodies respond uniquely to training. Know a study's population before you draw any conclusions! We know that individuals with more training experience simply will not respond as positively as a newbie. This is often referred to as the "principle of diminishing returns." Specifically, resistance training does not spark the same anabolic response or promote the same rise in muscle protein synthesis as compared to when you first started lifting. Therefore, when comparing different resistance exercise protocols, much of the previous research cannot be generalized to a trained population. In other words, it's time for us to start over and perform our research differently—and some recent studies have done just that. Much of the support for the hypertrophy style of training has been based on the conclusion that these workouts elicit the greatest post-workout increases in anabolic hormones. And yes, the research bears that point out. But...does it matter? It's beginning to look like it doesn't. Recent research suggests that these short-lived elevations in circulating hormones actually don't serve to enhance the muscle-building effect of a workout. My team also recently put this to the test and analyzed the anabolic activity within the muscle following a hypertrophy-style and a strength-style workout. Despite differences in post-workout hormone concentrations, the overall anabolic response was similar following both protocols. But that still begs the question: Which training style maximizes muscle size and strength? There have only been a few studies comparing bodybuilding to powerlifting training programs in resistance-trained men. In the first study, the researchers compared eight weeks of a standard hypertrophy-protocol versus a strength protocol.7 However, the protocols were "volume equated," meaning that one group was performing 10 sets of 3, while the other group was performing 3 sets of 10. Following the training programs, both groups ended up with similar growth in their biceps. However, the group who followed the strength protocol had better improvements in their 1RM bench press and squat. This study concluded that bodybuilding and powerlifting styles of training promoted similar increases in muscle size, but the powerlifting style of training was superior for enhancing maximal strength. Subjects who lifted heavy weights experienced the same muscle growth as those following a bodybuilding protocol. But they also got stronger. So what would happen if we dropped the volume for a strength group and really put the focus on intensity? That's what our research team recently investigated. All exercises: 4 sets of 6-8 reps, 80-85% 1RM, rest 1-2 minutes. So is this the final nail in the coffin for bodybuilding-style training? Definitely not! It still works; it's just not the only thing that works. Two studies have shown similar cracks in the rep-range gospel recently when they determined that even very low-load training can spark comparable muscle-growth gains if performed to muscular failure. [9,10] Our research indicates that strength development likewise shouldn't be overlooked. Hypertrophy and strength training should not be considered competing, but rather complementary methods of training. Don't following a training program simply on the basis that it increases post-workout hormone concentrations. If your goal is to build muscle, don't fear heavy weights. You shouldn't lose any mass during a strength phase. In fact, it may even spark some new gains. Utilize a wide variety of rep ranges and rest intervals in your training. Be sure to apply progressive overload to prevent those dreaded plateaus in gains. Try these two protocols for yourself, perhaps in back-to-back eight-week blocks. Then let me know how it worked for you in the comments! Barcelos, L. C., Nunes, P. R. P., de Souza, L. R. M. F., de Oliveira, A. A., Furlanetto, R., Marocolo, M., & Orsatti, F. L. (2015). Low-load resistance training promotes muscular adaptation regardless of vascular occlusion, load, or volume. European Journal of Applied Physiology, 115(7), 1559-1568. Moritani, T. (1979). Neural factors versus hypertrophy in the time course of muscle strength gain. American Journal of Physical Medicine & Rehabilitation, 58(3), 115-130. Phillips, S. M., Tipton, K. D., Ferrando, A. A., & Wolfe, R. R. (1999). Resistance training reduces the acute exercise-induced increase in muscle protein turnover. American Journal of Physiology-Endocrinology And Metabolism, 276(1), E118-E124. Gonzalez, A. M., Hoffman, J. R., Stout, J. R., Fukuda, D. H., & Willoughby, D. S. (2015). Intramuscular Anabolic Signaling and Endocrine Response Following Resistance Exercise: Implications for Muscle Hypertrophy. Sports Medicine, 1-15. Gonzalez, A. M., Hoffman, J. R., Townsend, J. R., Jajtner, A. R., Boone, C. H., Beyer, K. S., ... & Church, D. D. (2015). Intramuscular anabolic signaling and endocrine response following high volume and high intensity resistance exercise protocols in trained men. Physiological Reports, 3(7), e12466. Mangine, G. T., Hoffman, J. R., Gonzalez, A. M., Townsend, J. R., Wells, A. J., Jajtner, A. R., ... & LaMonica, M. B. (2015). The effect of training volume and intensity on improvements in muscular strength and size in resistance-trained men. Physiological Reports, 3(8), e12472.